It seems that Apple is looking to expand their territory a bit this month. The company is already in the process of remodeling many of its older stores to bring them up to date, with their 35th store having just recently been re-opened after receiving this treatment. Apparently, many of the Apple Stores that are currently open have been around since before the iPhone, and so were in need of a new look. 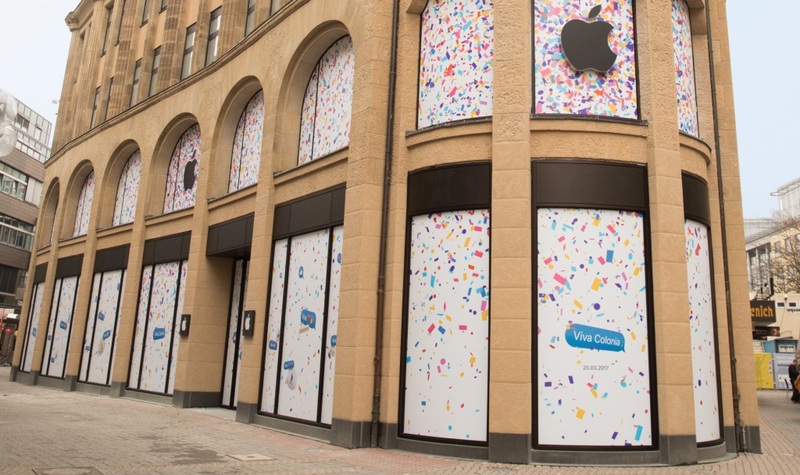 It's not all about giving old stores a new sheen though, as Apple is planning to open three new stores altogether. The first of these new locations will be in downtown Miami, which will be visually similar to flagship locations such as the Union Square store in San Francisco. It'll have a video wall and 13 foot tall ceiling-to-floor glass windows. The second location is in Cologne, Germany, where the store will be housed inside a historic building. You can get a look at the very nice looking architecture above, though its windows are currently covered with posters as they finish preparing it for the opening. The final store will be opening in Nanjing, though there doesn't seem to be much noteworthy info on this Chinese location. All three of these stores will be opening on March 25, so if you're in the Miami area you can check it out then.